Whether you’ve been doing cartwheels (please teach me how!) or typing all day, take the pressure off your wrists and lower arms with these 5 quick and easy stretches. Tension in the neck and shoulders leads to tension in the arms and hands. So we’ll start here. Stretching your neck and shoulders every day, not only helps your upper limbs, but also improves circulation to your Brain. Lymph node drainage, thyroid function, and even your vocal cords benefit from supple flexible muscles in this area. Allow your right ear to release down onto your right shoulder, taking at least a minute for allowing the ear to rest down towards the shoulder.Repeat on the left hand side. Yes the ear should touch the shoulder. Please send me a photo when this happens! Next, bring your chin down onto your chest. Keep the back of the next long and imagine you’re holding a soft peach under your chin. Lift your chin up to the sky, imagine you’re holding the soft peach behind your neck. Allow the front of your throat to soften and your shoulders to release. Take a few breaths here, then slowly lower your chin back to centre and draw your ears back over your shoulders. Lengthen up through the crown of your head to the sky. From here, bring your chin down onto your chest, roll it very slowly over to your right shoulder, back to centre, then over to your left shoulder. Do this a few times, moving with internal awareness, one millimetre at a time…slowly! Bring your palms together in Prayer Position in front of your heart. 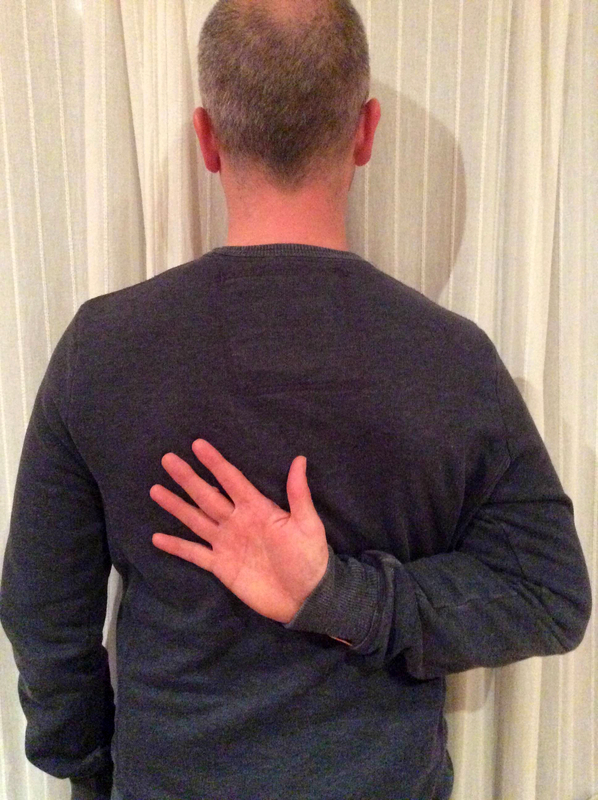 Turn the backs of your palms around to rest against each other. Line up the backs of each finger and the back of the thumbs. Anybody remember the rhyme: “Here is the Church, here is the steeple, look inside and see all the people” No, just me?! Draw the forearms down until your elbows bend at 90 degrees. Like Katy’s…. Hmm…Don’t worry if this doesn’t come naturally! Allow the sides of your neck to release, all the way down to the wrists, and out into the thumbs. The more often you do this stretch, the easier it will become. “Opposable” means that the joint of the thumb allows the tip of the thumb to touch the tip of each finger on the same hand. It’s the only finger that can do that! For fun, see if you can get your baby finger to touch each other finger on the same hand, one at a time. It won’t be on the tip, but try to make contact even on the side. Then try to get your ring finger, then your index finger to touch all other fingers one at a time. How easy or difficult it is to do it depends on the tension in your hands, forearms or even neck. Give it a try and remember to do both hands! 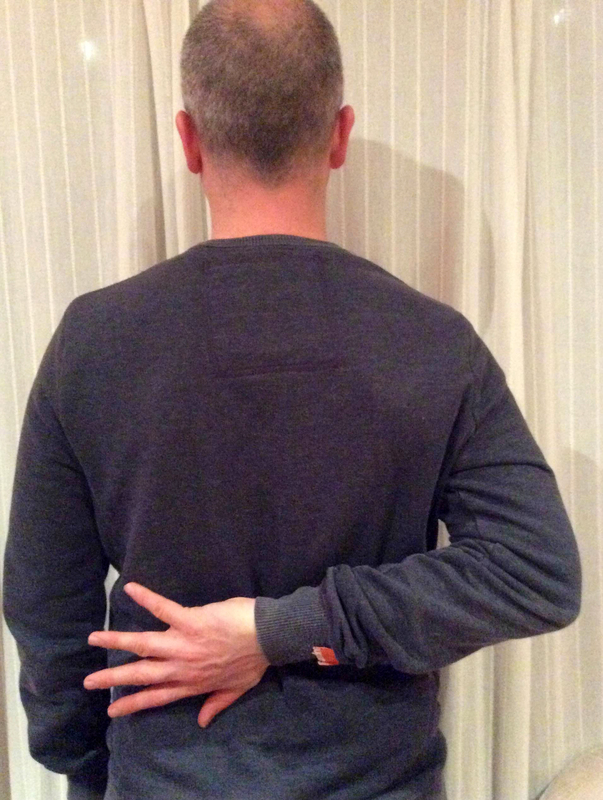 Step 1: Reach your right arm behind you, bending your right elbow and place the back of your hand on your mid-back. Keep the arm straight across and hold here for one minute. Your lower arm will be horizontal, parallel to the floor. Step 2: Now, try to bring it vertical, so the hand travels towards the back of your neck and your elbow releases down towards the right hip. Try not to arch your back, keeping your pelvis and spine in a neutral Tadasana, standing position. Step 3: Lower the arm back to it’s horizontal position (Step 1). Then flip your palm, so it rests against your back. Draw the arm up to vertical once more, keeping the palm facing onto the back and the shoulder blades drawing down your back.If the Shoulder Blade is winging a lot, i.e the bony edge of the shoulder blade is poking out of the skin, bring your elbow forward towards your front. Repeat Steps 1-3 on the left arm. Finally, reach both arms behind you and bring the backs of the hands facing each other, lowering the forearms until the elbows bend at 90 degrees. 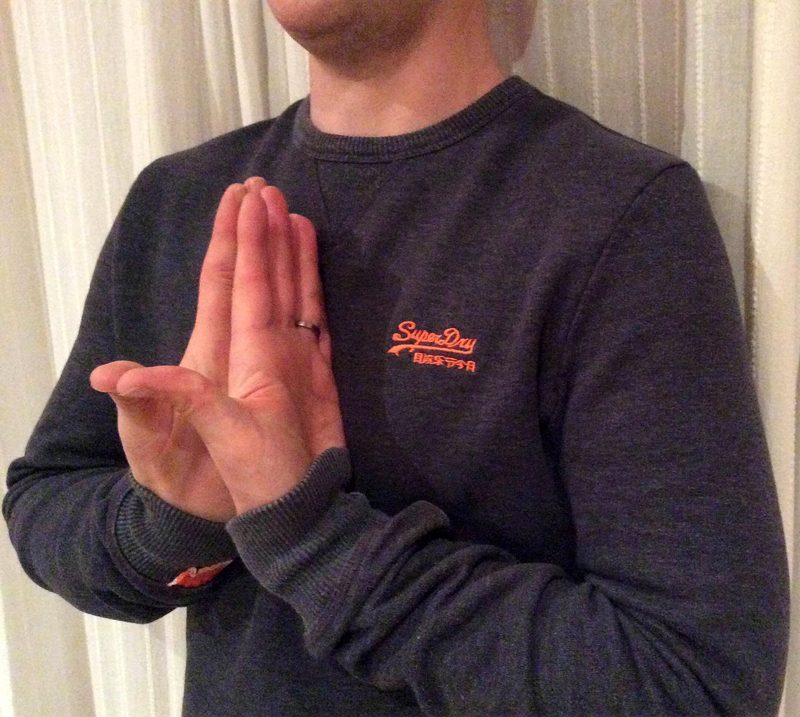 Then, flip the palms, so that they face together in Reverse Prayer Pose (Pashchima Namaskarasana) behind your back. See more on Pashchima Namaskarasana here. 5. Yoga for Wrist Strength: Read Part 1 here. When moving your limbs in a pushing or pulling motion, remember that your strength and energy comes from the centre of your body, and travels outwards from here to the extremities. Whether playing tennis, pushing a buggy, or reaching for the water cooler, try to move from your centre. Whole body movement brings strength to the muscle and takes stress off your joints. The next time you’re raising your arm to reach out, visualise the movement coming from your tummy button out into your arms, extending down through the fingertips, and reach beyond, so you bring strength in your actions through from your core. Whatever you’re reaching for, always try to move from your centre. This is Whole Body Movement. If you have any questions on wrist stretches or on the sequences we do in class, please leave a comment. If you try the stretches & they work, please click ‘like’! Your feedback is appreciated.